In 1971, Antonio Andrade Pereira Filho and Maria da Conceição Costa Pereira decided to invest in a farm of 90 acres in the city of Carmo de Minas, Minas Gerais. Antonio planted the first coffee seedlings and the couple started a family, raising two daughters: Maria and Maria Rogéria. Eventually the two women took over the running of the farm, along with their husbands, ushering in a new generation of coffee producers. With the eventual passing of Antonio, Maria and Maria Rogéria decided to continue running the farm together. Thus they changed the name of the farm from Serrado to Irmãs (Sisters) Pereira, ushering in a new spirit to their coffee production. Irmas Pereira is perched in the high mountains of the South Minas Water Spa Circuit, near the towns of Lambari, Carmo de Minas and São Lourenço. The estate boasts great altitude, climate and dedicated management and workers. The coffee bushes grow in fertile mountain soil at altitudes ranging between 3,500 and 4,000 feet. These high altitudes favor slow ripening of cherries and permits selective picking; both decisive factors in producing exceptional coffees. The estate utilizes top quality processing equipment: a state-of-the-art wet mill that recycles and reuses waste water, paved drying patios, mechanical driers and wooden silos for coffee to rest. However, the combination of these tools, combined with the exceptional climate and advanced agronomic techniques, would be wasted without the personal dedication of the estate’s owners and commitment the well-qualified team of approximately 35 employees. Sweet Shower is one of the methods of Irmas Pereira's exclusive program called New Flavors®. It consists in a controlled fermentation of shelled coffees. It’s almost like a twist in the typically Brazilian Natural method in which the cherries are left overnight into a tank filled with very cold water for for about 15 hours. This is what allows a controlled and soft kind of fermentation to happen. The cold water avoids the full and unwanted fermentation of the coffee beans. After this period of being submerged in cold water, in the morning, the coffee is put on an African bed and stays there for 14 days or until it reaches the desired humidity level. The coffee is kept in their dry shells until 16 days before it’s prepared for trading or for a competition like the CoE Brazil - Naturals, in which we achieved the 2nd place with a sample from Fazenda Irmãs Pereira processed in this method. Sweet Shower results in a very sweet coffee with fruity notes, caramel sweetness, pleasant citric acidity, soft velvety body and a smooth aftertaste. You can find this special preparation coffee on CCS' current offering list. Jacques, this change can be facilitated, but the first challenge is to pick a technique. On top of this are the added associated costs. Historically, the picking technique has been picking the coffee bush clean (stripping) during one picking and one harvesting season. Most people do this and even use partially mechanized equipment to do the job, which is more time-effective. 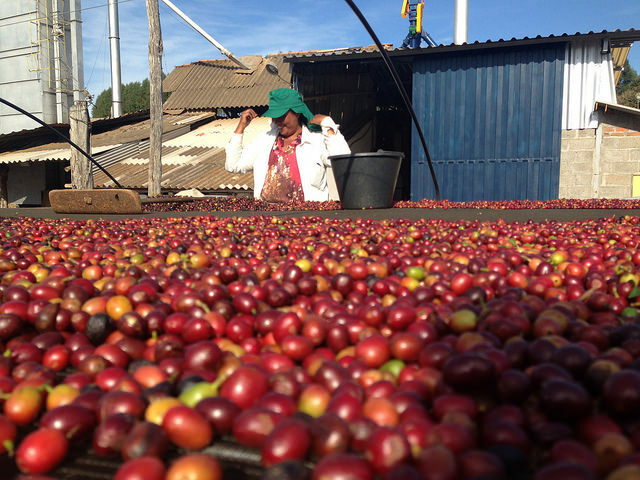 But to get the sweetest coffee, you have to pick the sweetest, ripest cherries.